From the UK's No.1 comprehensive beauty formula, Perfectil Max provides the ultimate beauty support from the Perfectil range, for women seeking maximum nutritional support for their skin, hair and nails. 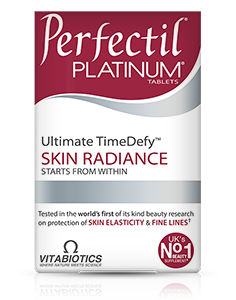 Beauty really is skin deep, and Vitabiotics knows only too well that what you put inside your body has an enormous impact on your internal health and your outer appearance. Perfectil Max complements your daily beauty regime, providing an advanced Perfectil Plus† tablet with a specialist Nutri-Dermal™ capsule. Our skin, hair and nails all require specific vitamins and nutrients. Perfectil Max works by delivering nourishment through the bloodstream, so works 'from within'. 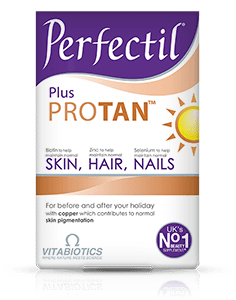 The Perfectil Max formula has been developed to support all round general health and wellbeing and includes Vitamin C and copper to contribute to the normal function of the immune system and iron which contributes to the reduction of tiredness and fatigue. Because Perfectil Max is so comprehensive, there is no need to take an additional multivitamin. 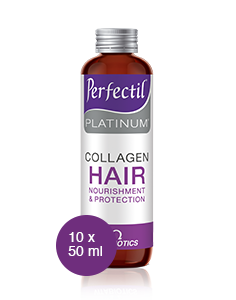 Perfectil Max is available in the UK from Boots, Superdrug, Tesco, supermarkets, pharmacies and health stores including Holland and Barrett. Alternatively order online here. Dual pack providing 56 vitamin, mineral, amino acid and botanical extract tablets plus 28 Biotin, Fish Oil, Starflower and Blackcurrant Seed Oil capsules. Calcium Carbonate, Potato Starch, Polyvinylpolypyrrolidone, Cross Linked Cellulose Gum, Methyl Sulphonyl Methane, Horsetail Powder Extract, Magnesium Oxide, Bulking Agents: Dibasic Calcium Phosphate & Microcrystalline Cellulose, Vitamin C (Ascorbic Acid [Carrier: Hydroxypropylmethylcellulose]), Tablet Coating (Hydroxypropylmethylcellulose, Propylene Glycol, Ethyl Cellulose, Purified Talc, Natural Source Colours: [Titanium Dioxide, Iron Oxides]), Polyvinylpyrrolidone, Hydroxypropylcellulose & Ethyl Cellulose, Anti-caking Agents: Stearic Acid, Silicon Dioxide, Purified Talc & Magnesium Stearate, Pantothenic Acid (as Calcium Salt), Vitamin E (D Alpha Tocopheryl Acid Succinate) (from Soya), Ferrous Fumarate, Zinc Sulphate, L-Methionine, L-Cystine, Citrus Bioflavonoids, Niacin (Nicotinamide), Thiamin (Vitamin B1 Mononitrate), Vitamin B6 (Pyridoxine HCl), Grape Seed Extract, Vitamin D3 (Cholecalciferol, Medium Chain Triglycerides, Colloidal Silica, Purified Talc, Maltodextrin, BHA, Ethyl Cellulose), Natural Mixed Carotenoids (Betacarotene, Modified Starch, Sodium Ascorbate, Corn Starch, Glucose Syrup, Antioxidant: DL-Alpha Tocopherol), Vitamin B12 (Cyanobalamin, [Carrier: Dicalcium Phosphate]), Riboflavin, Manganese Sulphate, Co-Enzyme Q10, Copper Sulphate, Folic Acid (as Pteroylmonoglutamic Acid), Sodium Selenate, Potassium Iodide, Chromium Trichloride, Biotin. Allergy Advice: For allergens, see ingredients in bold. Omega-3 Fish Oil (from Fish), Starflower Oil, Capsule Shell (Pharmaceutical Grade Gelatin, Glycerol, Natural Lemon Flavouring & Natural source colour [Red Iron Oxide]), Blackcurrant Seed Oil, Lutein Esters, Silicon Dioxide, Co-Enzyme Q10, Tomato Extract (Lycopene, Natural Tocopherols, Phytoene, Phytofluene, Betacarotene, Phospholipid, Phytosterols), Biotin. Allergy Advice: For allergens, see ingredients in bold. Two tablets (Red Blister) per day plus. One Capsule (Turquoise Blister) per day. Swallow each with water or a cold drink and take with a main meal. Not to be chewed. Do not exceed recommended intake. Only to be taken on a full stomach. As with other food supplements, seek professional advice before using if you are under medical supervision, pregnant, breast-feeding or suffer from food allergies. Do not take if you are allergic to soya, fish or fish products. Allergy Advice: For allergens, see ingredients in bold. Food supplements must not replace a varied and balanced diet and a healthy lifestyle. This product contains iron, which if taken in excess, may be harmful to very young children. Store below 25°C in a dry place, out of sight and reach of children. Why has Perfectil Max been developed? How does Perfectil Max differ from other products in the Perfectil range? Who should use Perfectil Max? Can Perfectil Max be used during pregnancy and breast-feeding? Can Perfectil Max be taken simultaneously with medicines? 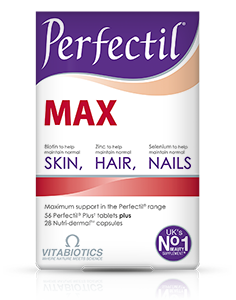 How many tablets and capsules does one pack of Perfectil Max contain? How and when should Perfectil Max be used? What happens if I forget to take my Perfectil Max and miss a day? Are there any undesired effects whilst taking Perfectil Max? Is Perfectil Max suitable for vegetarians? 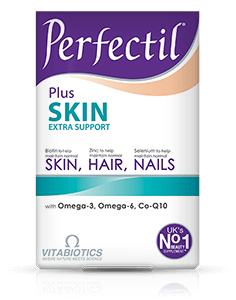 Perfectil Max has been developed for those who are looking for the ultimate support in the Perfectil range to maintain the health of skin, hair & nails. · Perfectil Max dual pack contains multi-nutrient tablet with over 25 important vitamins and minerals including selenium, zinc, biotin and B-vitamins. 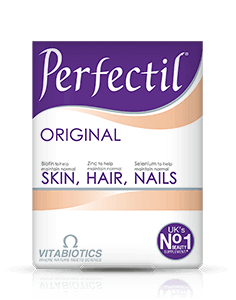 - Perfectil Original is a one-a-day tablet formula targeting skin, hair & nail health with over 20 nutrients. - Perfectil Plus Skin combines the original Perfectil tablet formula with a specialist Nutri-Dermal capsule with Biotin which contributes to the maintenance of normal skin. - Perfectil Plus Nails provides nutrients important to nail health including extra selenium which contributes to the maintenance of normal nails. - Perfectil Max formula includes a multi-nutrient tablet with over 25 nutrients plus a Nutri-Dermal capsule for the ultimate support in skin, hair and nail health. Perfectil does not contain any drugs or hormones and is produced in accordance to GMP standards of quality control, beyond those normally required for food supplements. Always see pack before use for full information and directions. Do not exceed the recommended intake. As with other food supplements seek professional advice before using if you are pregnant, breastfeeding or suffer from food allergies, and consult your doctor or pharmacist if you have an underlying medical condition or if on medication. Do not take if you are allergic to soya or fish. This product contains iron, which if taken in excess may be harmful to very young children. Vitamin supplements are not intended to treat or prevent any disease. Food supplements must not replace a balanced and varied diet, and a healthy lifestyle.